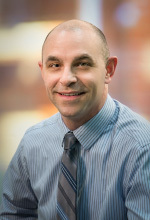 Dr. Albertson is an assistant professor of pathology at the University of Utah School of Medicine. He received his MD from the University of Nebraska and completed his residency in anatomic and clinical pathology at Creighton University, followed by a surgical pathology fellowship at the University of Utah. While at Creighton, Dr. Albertson served as the chief resident for two years and received the Hal Lankford Pathology Resident Award. He is a member of United States and Canadian Academy of Pathology and the College of American Pathologists. Dr. Albertson’s special research interest include oncologic genitourinary pathology.